The deadline to submit proposals for the CIES 2018 Northeastern Regional Conference has been extended to Friday, September 14, 2018. This year the Northeastern Regional Conference will focus on "Rethinking the Purposes of Education and Lifelong Learning in the 21st Century. "The conference organizers invite participants to address different analytical and policy-oriented questions about the aims and purposes of education. The type of proposals include: 1) individual paper proposals, 2) quick-fire talks and 3) poster sessions. Proposals should be based on original work that expands current knowledge in the field of comparative and international education or reconsiders existing educational policies and practices. Priority will be given to proposals that address conference themes. Individual proposals (not session proposals) are required in order to foster conversations among presenters from different institutions. As part of the registration process proposers can indicate relevant papers that have been submitted by other prospective participants. All proposals must be submitted via the conference website, www.albany.edu/cies2018/. For more information on the theme, please visit the conference website here. The online payment system for Regional Conference registration is now available! To register and/or pay your fees click here, which will take you to the registration form on the CIES site. We are pleased to invite you to submit a proposal for CIES 2019 San Francisco, the 63rd Annual Conference of the Comparative and International Education Society (CIES).The event will take place in San Francisco, California, from April 14-18, 2019. The theme of the conference is “Education for Sustainability.” Explore www.cies2019.org for more information about the conference, including the full Call for Contributions. 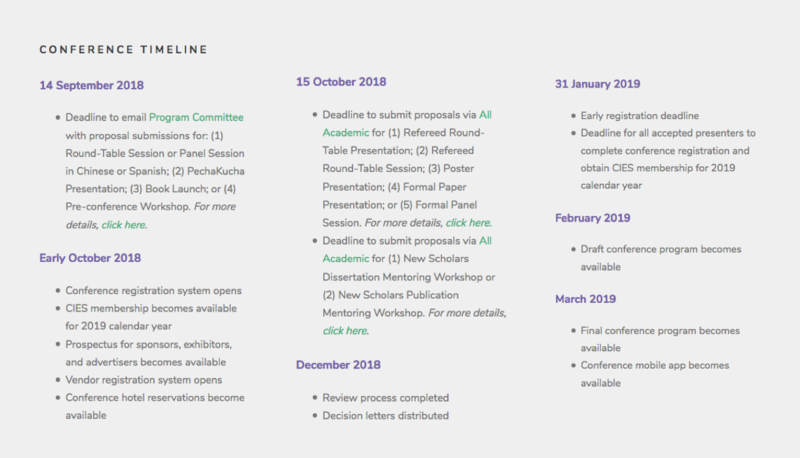 There are four kinds of contributions that should be emailed directly to the CIES 2019 Program Committee, which will make decisions based on quality and available space. Please note that these kinds of proposals will be reviewed on a rolling basis and have an earlier submission deadline of Friday, September 14, 2018.